Product prices and availability are accurate as of 2019-03-05 23:53:03 EST and are subject to change. Any price and availability information displayed on http://www.amazon.com/ at the time of purchase will apply to the purchase of this product. 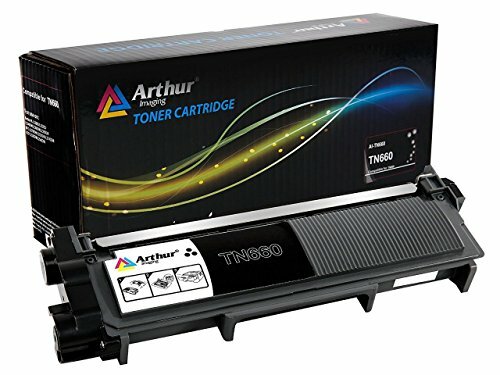 Arthur Imaging Compatible Toner Cartridge Replacement for Brother TN660 is d to perform with your Brother laser printer. It replaces the original Brother TN660 laser toner cartridge, and can be used in the following Brother Printers: - DCP-L2520DW, DCP-L2540DW - HL-L2300D, HL-L2305W, HL2320D, HL-L2340DW, HL-L2360DW, HL-L2380DW - MFC-L2700DW, MFC-L2720DW, MFC-L2740DW This is not a remanufactured cartridge and it was not manufactured by Brother. Our compatible replacement TN660 laser toner cartridge is specially engineered to meet the highest standards of quality and reliability. Our TN660 toner page yield meets or exceeds OEM (Original Equipment Manufacturer) page yield for the Brother TN660 and offers high-quality printing results. The use of Arthur Imaging compatible replacement laser toner cartridges and supplies does not void your printer's . We offer a 100% Quality Satisfaction on our Arthur Imaging compatible TN660 laser toner cartridges and supplies.